Get ready to have the safest shed in the neighborhood. Send criminals of any caliber packing when they see your shed locks. There are just a few things to know before you start selecting the best shed locks for your needs. You need to know the type of shed locks that will and will not work for your structure. The things to consider about each style of shed lock. And after you see the best options for shed security locks, there is still more to learn. But don’t get too overwhelmed. We will start slow. If there is a list that mentions great padlocks, the Stanley Hardened Steel Security padlock has to be on it. It is a padlock with a low price to entry and a good foundational level of security. The security you get from using this lock straight out of the package is a hardened steel shackle, which is going to give a good amount of fight to a pair of bolt cutters. The shackle is shrouded with the same hardened material used to make the lock body. It is a solid and heavy duty lock. It also has an interchangeable core, so if you have the desire to increase the security of your shed padlock, you can get a higher security core. 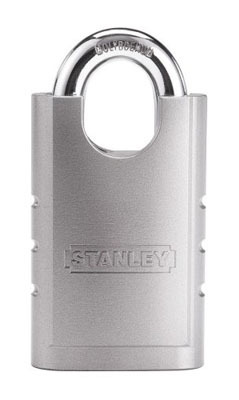 The lock core that comes standard in the Stanley padlock is pretty good compared to what most people use for shed locks, but that is not the same as being high-security. There are a couple security pins in the standard core, and it will be harder to pick than most Master Locks or some of the other locks that provide terrible security. But if you do not change out the core, you will still have an anti-drill plate for some additional protection. It depends on how at risk your shed is of being broken into and how much you care about protecting what is inside, but as far as shed locks go, this is the lowest security I would recommend. When you need a deadbolt, the Mul-T-Lock Hercular with MT5+ core deadbolt is a great lock to invest in for your shed locks. This is the only deadbolt included on the list for two reasons. 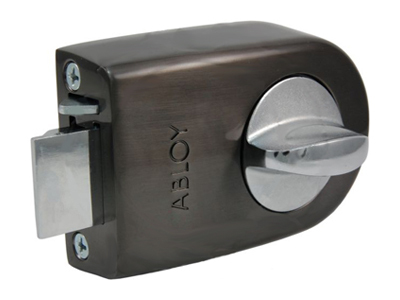 The first is that I mentioned the Abloy Protec2 two times (for what I think are good reasons). And the second is that the Mul-T-Lock Hercular gives you everything you need from a deadbolt and a few additional things to set it apart from any other shed lock. Not only are you getting a lock with a great core that will prevent many forms of covert and surreptitious entry, you also getting remarkable anti-drill protection and a hardy bolt that is going to resist some of the most serious forms of cutting. But wait… there’s more! The Hercular also comes with its own strike plate housing, which pairs with the ball bearing infused bolt. As a result of this security measure the bolt grips into the housing so that it cannot be pried free, even with a considerable amount of force. 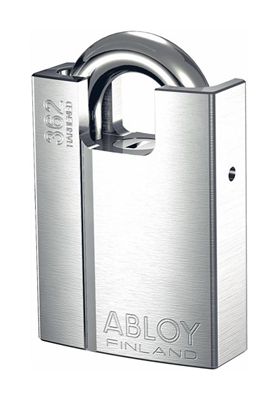 Back to padlocks again, what we have with the Abloy Protec2 model PL 362 is a shrouded hardened steel padlock, with what is likely the best disk detainer lock core in existence. The reason I have pointed to this model is because it is the largest Abloy Protec2 padlock currently being made. That means you are getting thicker metal throughout the lock’s composition. More metal means more resistance to forced entry attacks. You will need a relatively large hasp if you are intending to consider this as one of your shed locks, but it would be worth it to place this lock on your shed. This lock is an improvement on the Stanley padlock by leaps and bounds. Placing the two best shed locks next to one another, you can see the difference in specs. However, the 362 might be too much security for your shed. And by too much security I mean, it has a cost that prevents most people from a comfortable purchase. But if your garden shed has thousands of dollars worth of equipment and valuables, there is not a whole lot better you could choose in terms of garden shed locks. If you need, want, or even just considering a shed door latch for one of your shed locks, look no further than Abloy’s Protec2 Rim Latch. This is on the list because you need to know about the best shed locks, and locks don’t get a lot better than Abloy, but rarely is a rim latch going to make it onto any type of best lock list. They are a lock that is only necessary for specific circumstances but shed locks happen to be one of those circumstances. What you are getting with this investment is a no nonsense lock providing you the highest level of security of any other model of a similar style. If you are already using this style of shed door latch, and you want the best security possible, it is relatively easy to replace what you have with this Abloy. You can install this product on either side of your shed, so there is no need to worry about the shed locks not having the right orientation. The lock comes with the hardest hardware, and you don’t have to worry about what type of rim cylinder you are going to install inside the lock body of the shed door latch. Because you are likely to be choosing between the best padlock for a shed, I thought I would add the final level of security you could possibly need for your shed. 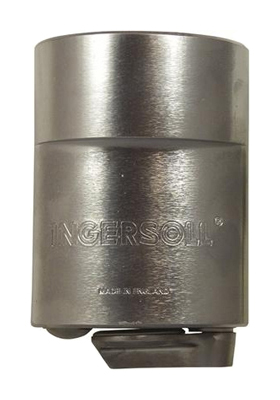 Ingersoll has made a 10 lever padlock that is best described as a solid chunk of security. It is the perfect level of obscurity and physical security. The result is something that is going to confuse any burglar looking to open it. When this lock is on your shed, you are going to need some other forms of security, because a criminal won’t even bother with this lock. Is this the best padlock of all time? It is close. But you don’t need the best padlocks. You need the best shed locks. A better question is, “is this the best padlock for shed?” And the answer to that is, yes. A shed can only be so secure, so this is as secure of a lock as I would recommend. If you need something better than this, you should put whatever you are securing inside a vault or the sturdiest safe you can find. Between the solid metal construction that is going to resist almost any type of violent entry someone is going to throw at it, the lock core is unbelievably secure. But with anything this good, you really do have to increase your general security. What type of shed locks are you looking for? There is more than one option for the best shed locks than just looking for the best padlock for a shed. A shed padlock is good in most instances of shed security, but I want to discuss other options you can take advantage of for your shed door locks. And with the different types of best shed locks, you need to know what to consider about each of them. When do they work? When do you need to consider another option? Generally shed locks are padlocks. A padlock is often the go to for shed security locks because any door can be fitted with a hasp. And once a shed door has a hasp, all you need is the right shed padlock. However, it is important to make sure the hasps for the best shed locks are secure themselves. The easiest thing to take note of with your lock hasp is to look at the device when the door is secured. While secure, the hasp should not display any of the set screws it is using. If set screws are displayed, make sure that the heads of the screws are non-standard. If the hasp can be taken off the shed door, it will not matter how many of the best shed locks you have. The hasp being vulnerable undercuts the security of any locks for sheds. Because the shed is outside, you will also want a lock and hasp that can withstand weathering. A rusting bolt or lock can cause insecurity in a shed, and also prevent you from gaining access as efficiently. Every lock on this list is going to handle the elements well, so make sure you can say the same for the hasp of your shed locks. Deadbolts are not always an option for shed locks. 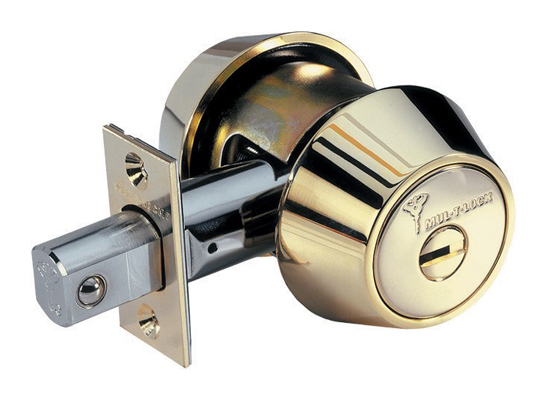 In fact, it is very rare that you will have the appropriate type of door or door jamb to properly install a deadbolt. However, sometimes something like a garden shed will have a standard home door on the front of it. When this is the case, you could look for garden shed locks in the deadbolt classification. But you will need a thick door that closes in a thick door frame so that a strike plate can be used to secure the bolt when the deadbolt is locked. If you cannot cross bore into the door of your shed, you should not consider a deadbolt as one of your possible shed locks. Do not try to use deadbolts as shed door locks if they don’t work with your type of door. Yes, deadbolts can withstand quite a bit of force, but that is only if they can be installed properly. A good litmus test for the success of a deadbolt as a lock for a shed if to ask yourself, could you use your shed door as your front door. If you could not use it as your front door, then chances are deadbolts would not be the right choice for your shed locks. Many shed doors are too thin for traditional deadbolts, which you would find on the exterior doors of homes. This will mean you cannot use a deadbolt, but you might be able to change up the lock hardware. Rim locks (aka rim latches, and sometimes referred to as a shed door latch) are extremely popular for shed door locks. This is because the hardware can be left outside of the door on the interior side of the shed. Even with a rim lock, you are likely to need to secure the shed door locks to the crossbeam on the framework so the shed locks have enough material to be fitted properly. More important than the issue of the door thickness, the thickness of the door jamb is what a rim latch is addressing. But you will only need this thickness at the point where the shed locks are installed. Of course, with a thin door, you are undermining any shed door locks you might choose. Blunt force to the door might break the door itself no matter how strong a shed door latch is. Exterior Hinges – Hinges for most sheds are on the outside of the structure. This means that the doors will open toward you when you are entering the shed. If the hinges are secured with Philips head or flat head screws, then they can be easily be removed by a criminal. It is best to use bolts, secured on the inside with nuts and washers, or use specialty screws that cannot be uninstalled. You need hinges with end caps on both sides so that the securing bolt cannot be knocked out and the door cannot be taken off. If the securing bolt can be knocked loose, it will not matter how the hinges themselves are screwed in. Locking Bars – Because shed doors are so inherently flawed, it is incredibly beneficial to add some strength. Locking bars add reinforcement to the material of the door, and a hardier securing point for a padlock than most heavy duty hasps. It is a great way to give your shed locks something more substantial to lock onto. But besides helping the shed locks, you can use multiple bar holders to add a secondary method of securing a door, besides the exposed hinges. If the hinges are removed, bar holders on both sides of the door and the door itself will keep the door from falling in. If you have secured your exterior hinges, helping the shed padlock should suffice. With this knowledge, you will not only be able to choose from the list of best shed locks, but you will be able to get the best shed security possible. Shed door locks are not the only that matters if you are looking to get the best possible protection from your shed padlock or any other type of shed locks. Make sure that you are using the right shed locks before you make your purpose. Know what you need, then get what you need. Don’t put the cart before the horse. And make sure you get both the cart and the horse. (The metaphor being that you don’t focus on the shed locks to the exclusion of your other security measures). Then you can protect anything you are storing in your shed.